I’m looking for a large, fat white and purple penguin with orange beak and feet I won out of a vending machine 2 years ago. 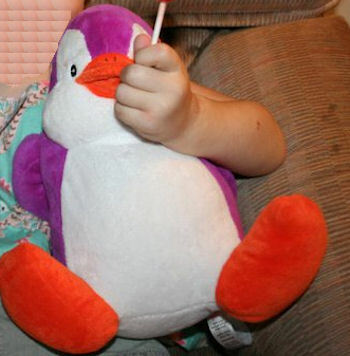 On our family vacation in 2009, I won the penguin out of a claw machine, and my daughter swooned over it before it even dropped in the dispenser. She lost Purpie last year and is absolutely broken hearted still. She has a framed photo of the two of them together right next to her bed, and she touches it and cries for him. If you can help me find this penguin, I will be forever indebted.